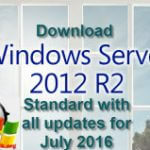 Hello dear blog readers, post the latest version of the next Windows Server 2008 R2 Enterprise with all the updates for April 2017. As before, the image based on the original MSDN ISO downloaded from the Microsoft website. As usual everything is flooded Yandex on disk for your convenience. So, download windows server 2008 r2 x64 english you will not take much time and labor. The last assembly, I downloaded more than two million times, agree that it says a lot about quality, both in terms of and reliability. Recently I conducted an experiment became to establish in parallel a clean image and my new, naturally pure established quickly, I started to update it, in the end, after about 15 minutes I set my updated and in fact it could have further sharpened by the service, and Now clean yet updated for 3-4 hours in a working day is a long time, savings in the face. This ISO image suitable for a clean installation of the system. If you do not know what next to do with the way Windows Server 2008 R2 Enterprise, then I advise you to check out how to create a bootable USB flash drive with Windows. 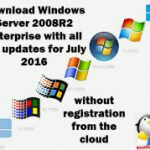 Activate Windows Server 2008 r2, you can follow the link. I am engaged in the creation of this assembly is already more than two years, according to statistics of downloads, I can conclude that it is the people happy. Actually, I was more and more comments to come, that the ISO saves people time and energy, and thus re creating it every quarter, I'm not doing this for nothing. If you have any suggestions I can take them into account when creating the next releases.